In the 1860s, it was not uncommon to find advertisements on the front page of The Times for a book on beauty by one Madame Rachel. The book, more of a pamphlet at only 24 pages, was published in 1863, and could be purchased at 47a New Bond-Street. Available to the discerning buyer for only 2s. 6d. it was entitled Beautiful for Ever, and, according to the advertisement, was a book "on Female Grace and Beauty." Certainly Madame Rachel had no lack of imagination when it came to describing her products! Such "puffery" was not unique, nor was it limited to the beauty products available for women. The Gentleman's Magazine, in December, 1863, ran a half-page advertisement for Rowlands' products; calling its Macassar Oil, "a delightfully Fragrant and Transparent preparation ... an Invigorator and Beautifier beyond all precedent." Its Kalydor, which was a skin preparation for women, was "unequalled for its rare and inestimable qualities" not to mention "the radiant bloom it imparts to the Cheek." The 1860s was a decade in which beauty was increasingly seen as a commodity. The design of the commodity was based on those who were considered the beauties of the age. Morality had little to do with this as Skittles, one of the great courtesans of the nineteenth century, was widely admired and imitated by all classes of women. It was to those who sold "beauty" that many women turned, hoping to improve their chances, whether of marriage or of entering into a satisfactory liaison, by improving their looks. Madame Rachel, or Sarah Rachel Leverson, was born in 1806. She claimed that she entered the beauty business as a result of having her head shaved when she was hospitalized with fever. This greatly distressed her, for she was very proud of her ... fine flowing locks. ... The medical man ... told her ... that he would give her something that should make her hair grow rapidly and be more beautiful than ever. When, according to the story, this product worked, Madame Rachel began using it to colour grey hair and soon expanded her claims to her ability to remove wrinkles and generally to cheat the ageing process. It was particularly this reversal of nature's ageing process that had great appeal. The products sold by Madame Rachel and her ilk were of a most dubious nature. They promised much and great claims were made for their ingredients as well as their efficacy. In reality, however, most were simple concoctions, sometimes dangerous, but certainly unlikely to live up the the extravagent claims made for them. All through the nineteenth century goods were adulterated and so-called "beauty aids" were not an exception. Among the many "beauty" products offered by Madame Rachel were such delights as "Circassian Beauty Wash" and "Magnetic Rock Dew Water of Sahara, for removing Wrinkles;" the former for a price of one guinea and the latter for two guineas. A bottle of "Jordan Water" could be purchased for from ten to twenty guineas and something called "Venus's Toilet," for the same price. A professional beautifier. She claims the privilege of restoring youth to those who consult her. She also declares that she can make quite ugly people handsome. ...This woman deals in all sorts of curious secrets, but principally in cosmetics. Her shop in the Strand could, I fancy, tell many a strange history. Her clients go to her there, and she does what is necessary for them. Talking to you in this way. And adored me from that day. In August of 1868, Sarah Rachel Leverson, aged 43, was charged with unlawfully obtaining 600 pounds from Mary Tucker Borradaile by false pretences. In addition there was a further charge of conspiring to defraud Borradaile of 3,000 pounds. After listening to the evidence, the Jury retired but was unable to reach a verdict after five hours and was discharged. The following month, Madame Rachel was again placed on trial. The retrial allowed the further evidence to be brought forward. Mary Tucker Borradaile, according to her own testimony, was the widow of a Colonel and had been married for twenty-two years, six of which were spent in India with her husband. She had first met Madame Rachel in 1864 and had purchased some of her products. She continued over the next several years to visit the shop and buy beauty products until, in 1866 Madame Rachel "suggested a mode by which she could be made 'beautiful for ever,' asking for £1,000 for making her so." Clearly to encourage Mrs Borradaile to do so, Madame Rachel told her that a particular nobleman, Lord Ranelagh, was in love with her and would marry her. The sorry fraud took its course; Lord Ranelagh denying he had ever "authorized her to use my name in any way as representing a desire or intention on my part to marry Mrs. Borradaile." It was a story about exchanges of letters in false names, money obtained under false pretences and a confusing body of contradictory evidence. In the end, the jury believed that Mrs. Borradaile had been the victim of a scheme by Madame Rachel to obtain money by false pretences. A sentence of five years penal servitude was passed on Sarah Rachel Leverson. Apparently she did not learn her lesson, but went back to the "beauty" business. She was to appear at the Old Bailey ten years later where she was once again convicted of fraud and sentenced to another term of five years penal servitude. Sarah Rachel Leverson, Madame Rachel to the beauty trade, died, still in prison, in 1880. To download a copy of The Extraordinary Life and Trial of Madame Rachel At the Central Criminal Court, Old Bailey, London, 1868, click here. A list of her extraordinary products (and their prices) can be found on pp. vi-vii. On the Victoria Embankment in London, passed by millions of pedestrians every year, is an Egyptian obelisk known as Cleopatra's Needle. One of three, the other two are in New York and Paris, it is made of red granite and stands 68 feet tall. Passerbys occasionally stop and look at it or take a photograph for their album, but few would know the dramatic story of how the 180 ton monolith came to be erected in London, far from its original home. The obelisk was presented to the United Kingdom in 1819 by Muhammad Ali Pasha, the Egyptian Viceroy, to commemorate the Battle of the Nile in which the British, under Nelson, defeated the French Fleet in August 1798; and the victory of the British under Sir Ralph Abercrombie over the French in March 1801 at the Battle of Alexandria. Although the British government graciously accepted the gift, it refused to pay for the transportation of the massive obelisk to London; a cost estimated at around 5,000 pounds. In fact, as early as 1801 plans had been put in train to bring Cleopatra's Needle to London but they had been dropped when it was feared that the removal of the artefact would offend the Turkish authorities. Captain T. C. Head, who, in 1833, brought this matter strongly before the public, adds, 'that twelve years had elapsed since the notification was made, and the Needle of Cleopatra remains in its neglected state.' There seems to be a disregard of courtesy, as well as of policy, in not accepting the offer of a grateful prince. some difficulty in getting the public to have an eye to Cleopatra's needle, which is, nevertheless, valuable, on account of its connexion with the thread of history. There was, however, more serious discussion in the House of Commons in 1852 about it being brought to England by the proprietors of the Crystal Palace newly relocated in Sydenham. It was to be brought at the proprietors' expense but the Government reserved the right, should the Crystal Palace not prove as popular as expected, to take possession of it on the payment of the Proprietors' expenses. Toward the end of the decade, Charles Dickens's All the Year Round, was expressing the view that something needed to be done. The Needle belonged to England and should be brought home! 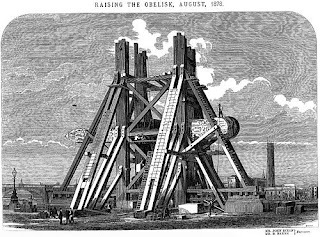 Nonetheless, it was not until the mid-1870s that serious efforts were made to bring the obelisk to England. The plan that was settled on for getting the obelisk to England revolved around the placing of the Needle in an iron cylindrical pontoon, 95 feet long and with a diameter of 15 feet. It had a draft of 9 feet, a displacement of 270 tons and with internal supports at ten foot intervals and elastic packing to secure the obelisk from shocks, it was well designed to take and transport the enormous "Needle." The pontoon had a rudder at its stern and a small deck house on top of the cylinder which allowed the steering of the "Cleopatra" as the pontoon was named. The deck house could house a small crew. In addition, although it was to be towed by steamer to London there were two small sails which were designed to steady the pontoon. obelisk of ancient Egypt, which has been left lying so long half buried in the sand at Alexandria, is now about to be made an ornament to the city of London. There were a few, not unexpected, problems.Very rough weather enroute from Alexandria to Gibralter was sufficient reason for the Captain of the Steamship Olga to decide that it was prudent to put into Algiers for coal. After setting out again, the Olga once more ran into bad weather. On Sunday, 13 October 1877 in a force 7 to 8 gale in the Bay of Biscay, the "Cleopatra" had to be abandoned . In an attempt to rescue those on the pontoon, a boat with six crew from the mother ship was swamped and all six lost their lives. The men are commemorated on a bronze plaque attached to the foot of the needle's mounting stone. Eventually Captain Booth was able to get the Olga next to the pontoon and rescue Captain Carter and the five remaining crew aboard "Cleopatra" which was abandoned and presumed lost. Within a few days, however, and despite a pessimistic assessment from Captain Carter, the Cleopatra was found floating comfortably in the sea some distance off Ferrol, a coastal town in northwest Spain. On Friday, the 19th of October, The Times reported the receipt of the following telegram from Lloyds. Ferrol, Oct. 18, 10.50 a.m. The "Fitzmaurice," steamer, from Middlesbrough for Valencia, fell in with and recovered at sea the Cleopatra's Needle recovered Cleopatra's Needle, 90 miles north of Ferrol. Less than a month later, at 7.00 a.m. on Tuesday, 15 January 1878 in fine weather, the Cleopatra resumed its voyage to England in tow behind the paddle tug, Anglia. the great obelisk arrived in the Thames estuary six days later, as debate raged over a permanent location for the needle. Finally, on Friday, the 15th of February, the Board of Works approved a site on the Thames Embankment at the Adelphi Steps. By the middle of September, the obelisk had been erected and within a month, the site had been cleared of all the material used in the erection of the needle. There it still stands, passed by millions of pedestrians every year of whom few, if any, know its true story. To download a copy of James King, Cleopatra's needle : a history of the London obelisk, with an exposition of the hieroglyphics (1883), click here. (1)For further information on Wilson and particularly his involvement with Turkish Baths, click here or go to Malcolm Shifrin's wonderful website at http://www.victorianturkishbath.org.